zioxi | News | News | How you sit is important! We spend an average of 13 hours a day sitting down, and the way we sit can affect our health and posture over our lifetime. How are you sitting right now? Do you have your legs crossed? Is your spine crooked? Are you slouched over? Thirteen hours a day of slouching and twisting, will take its toll on our bodies. No wonder your back hurts! There are a few simple things you can do right now to improve your posture when sitting. Now, in an ideal world we would keep this position forever, ensuring that every time we sit, our feet are level, our shoulders are lifted and we are pulling up from our core. But I suspect in about 10 minutes time when you have popped to get a cup of tea and a slice of Lemon Drizzle cake you will come back to your desk and sit the way you always do. Don’t feel bad, we all do it. And our lack of postural discipline is why the chairs we sit on are so important! A chair that is designed to support your lower back makes it harder to slouch and the give of the chair invites a rocking movement to keep your spine mobile. A footrest supports your feet and puts your legs at the right angle. Office chairs are always carefully chosen with lumbar support, adjustable arms and adjustable height as standard. Can you image the outrage if you walked into the office and were expected to sit on a one piece plastic chair all day. You know the ones I mean – they have four legs which are slightly bent and warped from years of rocking back, and a hard plastic shell. Yet these are the chairs that we expect our children to sit on at schools all day. And not only are they expected to sit on them they are expected not to fidget, to sit properly and concentrate. 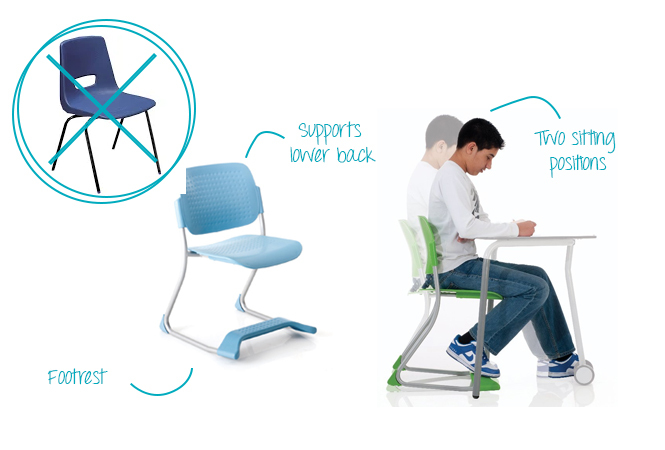 Our chairs encourage movement, they allow different sitting positions, and they support the spine and relieve pressure from sitting for long periods. This helps your students to concentrate. Why not organise a free trial so you can see what your students think?